VundoFix V2 is a free stand-alone tool designed for removing trojans of the infamous Vundo family and their widely spread variants. This utility targets the very first Vundo versions only. It does not remove more recent threats. VundoFix V2 is not an anti-spyware program. It does not scan the system for all known parasites that advanced spyware removers search for. This tool is just a small collection of a few simple command files and third-party utilities. Nevertheless, it perfectly does its job. KillVundo.bat is the tool’s main file. It contains specific commands and calls other VundoFix V2 components. 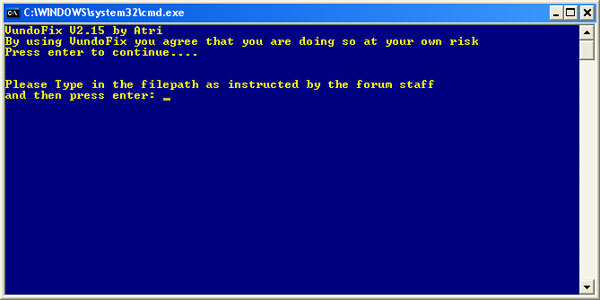 Once executed, KillVundo.bat asks the user to provide the full path to trojan files. If the filenames are correct, VundoFix V2 deletes the files, and thus eliminates the infection. The utility does not have any modern graphical interface. However, it can be easily used even by inexperienced users. VundoFix V2 provides a simple, but yet quite user-friendly text mode interface. The tool is absolutely free. Its code is open and easily readable for everyone, who has some knowledge in system commands. The official web site is www.atribune.org. Please note that VundoFix V2 is not a full-scale spyware remover. It is a stand-alone tool that removes only several known parasites, and therefore cannot replace a powerful anti-spyware product. This entry was posted on 2013-04-11 at 04:17 and is filed under Parasite removal tools, Software.